The period between 1760 and 1840 witnessed revolutions in the political, social and industrial spheres. These included canal ‘mania’, the heyday of the stagecoach, and the development of fire-resistant buildings. All of these areas required the use of new materials, particularly cast-iron. 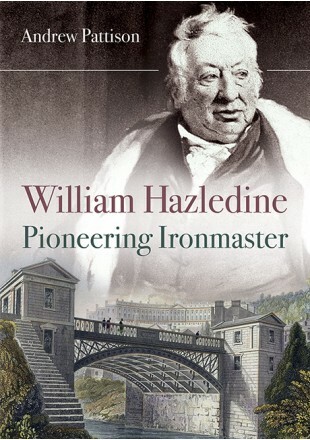 William Hazledine (1763–1840) was at the forefront of these exciting advances, supplying ironwork for at least five world ‘firsts’ – Ditherington Flax Mill, Shrewsbury; the aqueducts on the Ellesmere Canal; lock gates for the Caledonian Canal; a whole series of cast-iron arch bridges and the Menai and Conwy suspension bridges. Much of this work was done in conjunction with Thomas Telford. Andrew Pattison’s original research has rescued a hitherto little-known giant of industry from obscurity. This book is a summary of his researches. Dr Andrew Pattison is a retired General Practitioner and is now a local historian in Shrewsbury. He was awarded the Benjamin Baker medal of the Institution of Civil Engineers in 2015 for an article on William Hazledine. He is married to Lois and they have a large extended family.